With China yet to win at the 2016 Olympic Games in Rio, they know that they are going home at the conclusion of this game. Serbia may be joining them but at least they know their fate is in their hands. In fact, by the time they step on court they may be relaxed knowing that the point they take from playing will see them through to the knockout round but they may need to win this game to guarantee progress. If that is the case, Serbia won’t be too concerned and if the team were offered the chance to defeat China to make it to the playoff round, they would have jumped at it. This is a game that Serbia should be winning, regardless of how vital it is for their progress or not. Serbia faced USA recently and lost by just three points. Losing in such a narrow manner may leave them feeling disappointed in what might have been but the fact that they pushed the Americans harder than all other teams so far will give Serbia a boost. Nikola Jokić provided 25 points in the win and he’ll be looking for more of the same in this game. China were defeated by Australia and it was another game where they worked hard but lacked the class to really push or punish their opponent. Yi Jianlian notched 20 points and he’ll be desperate to have a similar performance in this match. Given that they’ll want to win in style, taking Serbia at -25, with odds of 1.90, isn’t the worst bet to opt for in this game. If you are looking at the Over/Under market, there is a great deal to be said for looking to go UNDER 160.0 which is available at odds of 1.90. Bet Now! 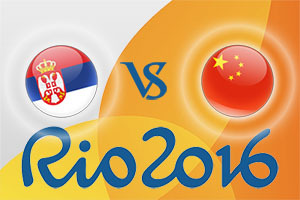 The Prop bets aren’t too exciting or enticing but if you think China will hold firm and limit Serbia to a win of 14 to 16 points, the odds are 8.00. A 17 to 20 point margin of victory for Serbia can be backed at odds of 5.00. The game starts at 0230 BST on Monday 15th of August.